Get the latest information about news and events of The HealthPath Foundation of Ohio. Visit this page to find out more about our trainings and webinars. The HealthPath Foundation of Ohio is now accepting letters of intent (LOI) for direct service projects related to our three result areas: Cavity-Free Kids, Healthy Ohioans, and Safe Elders. From these letters of intent, HealthPath will invite selected organizations to submit full proposals. The HealthPath Foundation recently approved $390,000 in grants to 8 organizations for projects related to workforce development. Projects represent work in all three result areas, and focus on developing a health care workforce pipeline or increasing skills of the existing workforce. Each year, 168,000 Ohio children are exposed to domestic violence, and this has lasting effects on them. To bring light to this issue, HealthPath partnered with Case Western Reserve University on Impact of Domestic Violence Exposure: Recommendations to Better Serve Ohio’s Children. 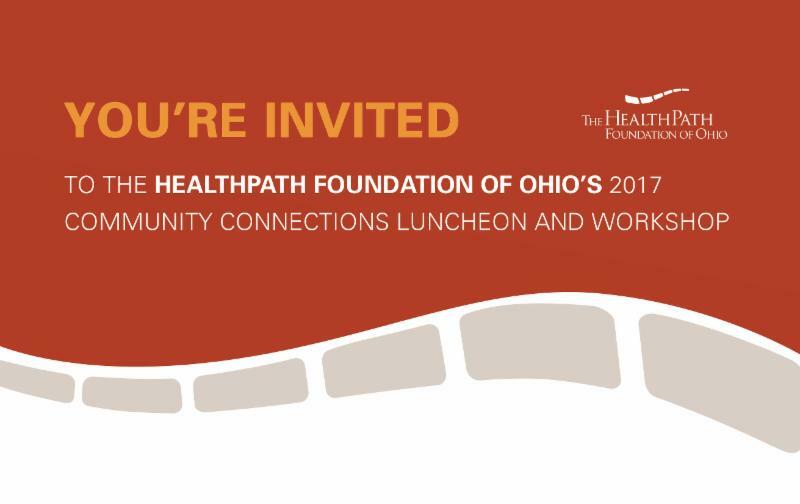 Please join us as we announce HealthPath's 2017 Community Connections grantees and the 2017 Community Connector Award winner, network and participate in break out sessions at The HealthPath Foundation of Ohio's 2017 Community Connections Luncheon and Workshop. The HealthPath Foundation of Ohio’s Community Connector Award will recognize an individual or pair of individuals who have dedicated their time and efforts to give all Ohioans the opportunity to achieve their fullest health potential. The HealthPath Foundation of Ohio is now accepting letters of intent (LOI) for workforce development projects related to our three result areas: Cavity-Free Kids, Healthy Ohioans, and Safe Elders. From these letters of intent, HealthPath will invite selected organizations to submit full proposals. The HealthPath Foundation of Ohio is now accepting proposals for the 2017 Community Connections initiative. The HealthPath Foundation of Ohio is hosting two Pre-Application Workshops to discuss our Community Connections funding opportunity for 2017. Cara Jacob has been hired as Research Coordinator for The HealthPath Foundation of Ohio, a supporting organization of The Greater Cincinnati Foundation and The Women’s Fund of GCF. HealthPath is pleased to introduce our new Executive Director, Eric DeWald. Eric begins at the Foundation on Friday, January 15, 2016. The HealthPath Foundation of Ohio recently released a 5-year Report to the Community. This report offers an overview of HealthPath's mission, vision and accomplishments over the last five years. More than 65,000 Ohio women are victims of physical intimate partner violence (IPV) each year, and more than 48,000 Ohio children live in homes where IPV is occurring. Older adults are the fastest growing segment of Ohio’s population and are living longer, often with chronic conditions and limitations that make them vulnerable to abuse, neglect, and exploitation. Preventing Elder Abuse in Ohio Report highlights the challenges of aging in Ohio, the issue of elder financial exploitation, and the role that HealthPath and all Ohioans play in preventing elder abuse. Voices for Ohio’s Children is a non-partisan organization that helps ensure that the needs of Ohio’s 3 million children are prioritized at the local, state, and federal levels. One example of how they do this is through the Children’s Oral Health Action Team (COHAT), which is a coalition of 30 organizations – from education and advocacy to health care and dental – who have come together to address the needs of improved children’s oral health in Ohio. With the recent news of the Supreme Court’s 6-3 decision to uphold the Affordable Care Act, access to quality healthcare is top of mind for many Ohioans. The HealthPath Foundation of Ohio supports organizations such as the Jefferson County Fourth Street Health Center (JCFSHC) that work to improve health care access for underserved populations. The HealthPath Foundation of Ohio today announced the appointment of Nolan Kamerer, of Cincinnati, to the organization’s Board of Trustees. The HealthPath Foundation of Ohio has invested in organizations like Warren County Community Services that implement programs, such as Friendly Visitor, which provides extra care to older Ohioans to enhance their quality of life and prevent elder abuse. In celebration of our 15th anniversary, The HealthPath Foundation of Ohio is sponsoring the Share Your Story, Ohio! contest. We are collecting stories from our 36-county service area to celebrate the work of our partners in the fields of family violence prevention, preventive oral health care, and strengthening Ohio's safety net. In 2014, 11% of Allen County adults had a period of two or more weeks when they felt so sad or hopeless nearly every day that they stopped doing usual activities. For youth in the county, this number represents more than one-quarter, or 29%, who reported they felt sad or hopeless. In 2014, the Health Assessment results indicated that 18% of Allen County 6th-12th grade youth had seriously considered attempting suicide in the past year and 8% admitted actually attempting suicide in the past year. Hundreds of thousands of children are physically abused each year by someone close to them. In 2014, more than 80,000 cases of child abuse or neglect were filed with children’s services right here in the Buckeye state. Talking About Touching is a program designed for students in kindergarten through third grade, which offers a series of classes that discuss important safety lessons. Programs like HPAC and Building Bridges to Careers strive to find the next generation of professionals who want to better serve their communities and become role models, helping HealthPath further its goal of improving workforce development. The HealthPath Foundation of Ohio (HPF-Ohio) has invested in multiple strategies for improving oral health and removing barriers to dental care for low-income and other vulnerable Ohioans, especially children. One initiative that HPF-Ohio has provided funding for is the Manchester School-Based Health Center Dental Project, which funds dental services for the students at Manchester schools in Adams County, Ohio. The HealthPath Foundation of Ohio (HPF-Ohio) awarded a total of $262,180 in grants in 36 counties. The funded projects that will increase access to health care, including primary, oral, specialty and behavioral health care. The HealthPath Foundation of Ohio, in partnership with the Ohio Colleges of Medicine Government Resource Center, is pleased to announce the release of the latest update of the Ohio Family Violence Prevention Project data set. The HealthPath Foundation of Ohio (HPF-Ohio) awarded its 2014 Community Connector Award to Kathy King, Guardian ad Litem and Court Appointed Special Advocate (CASA) Manager for ProKids in Cincinnati. The award was presented at the Foundation’s annual Community Connections Luncheon on October 3. Childhood sexual abuse is an uncomfortable topic to think about, let alone discuss with your children. But prevention means adults need to be educated. Find out how two HealthPath grantees are tackling this tough topic. According to the 2013 Ohio Health Issues Poll (OHIP), nearly 4 in 10 (39 percent) of Ohio adults reported having no dental insurance.